Approximately 180 students gathered for a rally on King’s Parade this afternoon before marching through the streets of Cambridge in a protest against University investments in the fossil fuel and arms industries, and to criticise the report produced last by the University’s divestment working group, two members of which were involved in overseeing major donations from two fossil fuel giants. 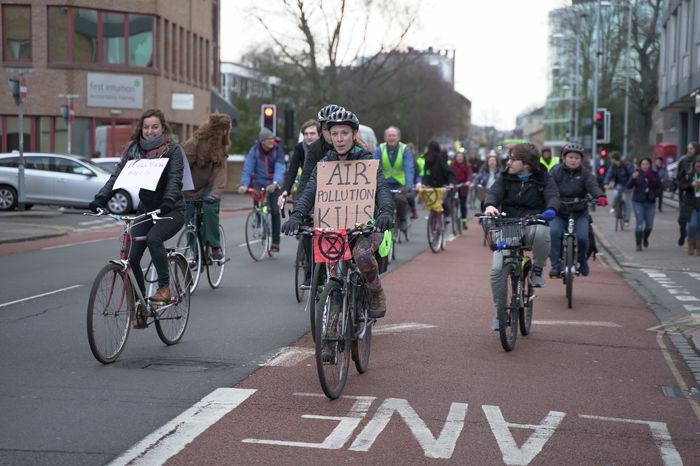 The protest was jointly organised by student activist groups Cambridge Zero Carbon Society, Demilitarise Cambridge and Cambridge Defend Education. Members of the Extinction Rebellion group, who have previously rallied through Cambridge, were also present. The protestors gathered in front of Senate House before marching around the centre of Cambridge, culminating with a protest outside Old Schools. The organisers stated that they demand that Cambridge recognise the “corruption” of the divestment working group and revoke its report, which they condemned as a “stitch-up”. They also called for the initiation of a “transparent and democratic process” to look into how the University could fully divest from fossil fuels. They told the protestors that the “pantomime [of the working group] has to end”. An online petition with the same demands has so far received over 1300 signatures. Organisers pinned a copy of their demands to the door of Old Schools before stating that they would protest again next Friday if no action is taken. Speakers at the event stated that “We will be louder” if their aims are not met, arguing that “divestment is just the beginning” and that “we are marching on behalf of life itself”. Marchers occupied main roads, letting off flares and chanting slogans including “This is what democracy looks like” and “Divest, Disarm, Decolonise”. The peaceful demonstration blocked streets and temporarily stopped traffic, including a bus at the top of Sidney Street. A spokesperson for Cambridge Zero Carbon said to Varsity: “The divestment working group has been revealed to be riven with conflicted interests, a complete stitch-up from the start. Two of its members were overseeing secret multi-million pound donations from fossil fuel companies; its chair holds investments in Shell, Total and BP; one member was working on a BHP funded research project; and a final member led a national task force funded by the fracking industry. Lat May, 200 academics signed a letter calling the report an attempt to thwart divestment following its publication last May. The report informed the landmark decision of the University to reject calls for full divestment, favouring instead ‘considered’ investment – to avoid direct investment in coal and tar sands, and keep indirect investment to a minimum. Today, speakers from Zero Carbon criticised the conclusion of the University that full divestment was too complicated, citing the fact that other universities such as Durham and Bristol have already committed to fully divest. The group’s report has received renewed widespread criticism in recent weeks following a Guardian investigation revealed last week that two of the members of the group, Professor Simon Redfern and John Shakeshaft, were directly involved in two proposed donations worth £22m to the University from BP and BHP Billiton, although the latter was later rescinded. Calls for divestment among both students and staff have escalated over recent years, with a six-day occupation of Greenwich house and a six-day student hunger strike in Easter Term last year in the run-up to the University Council decision regarding divestment. Several Colleges have already taken decisive action, with Queen’s College becoming the first to commit to full divestment in July last year. However, in November last year, a Varsity and Cherwell investigation revealed that of 20 Colleges which responded to a Freedom of Information request, 7 still held investments worth £20.7m in oil and gas exploration, production and refining. Trinity topped the list with £9.1m of investments, followed by Emmanuel with £5.7m.